A Bright Posy with Beach Vibes! 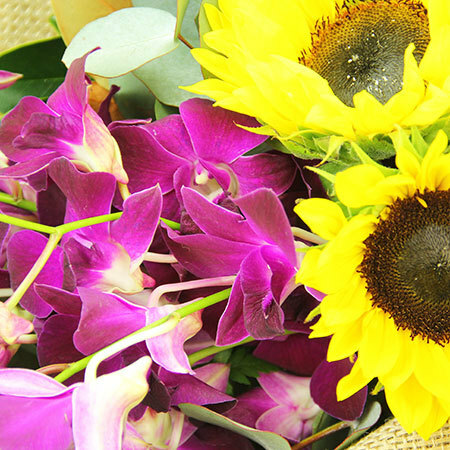 Our bright posy of tropical purple Singapore orchids mixed with cheery yellow sunflowers totally exudes an Australiana beach vibe! 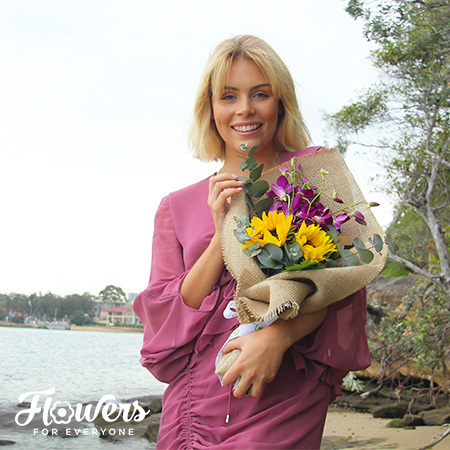 Presented in a natural hessian wrap with highlights of silvery Eucalyptus gum and fern, this great value flower posy is an awesome choice for birthdays and thank you gifts. Team it with a fragrant ECOYA candle, bottle of bubbly or bar of milk freckle chocolate from our range of add ons and you have the ultimate gift! 2019-01-23 Service rating : Excellent service, delivery was on time and the flowers were fantastic!